Chateau / Country House269 sq. ft.
CASA MYRTA includes two large cottages CASA ALBITRU and CASA ROSUMARINU plus a small cottage CASA AMANDULU. The property extends over one hectare of agricultural land planted with olive trees, holm oaks, palms and fruit trees. It is surrounded by the maquis of a large valley at the foot of the majestic mountains and opening onto the Gulf of Calvi. From your cottage you can see six of the most beautiful villages of Balagne. 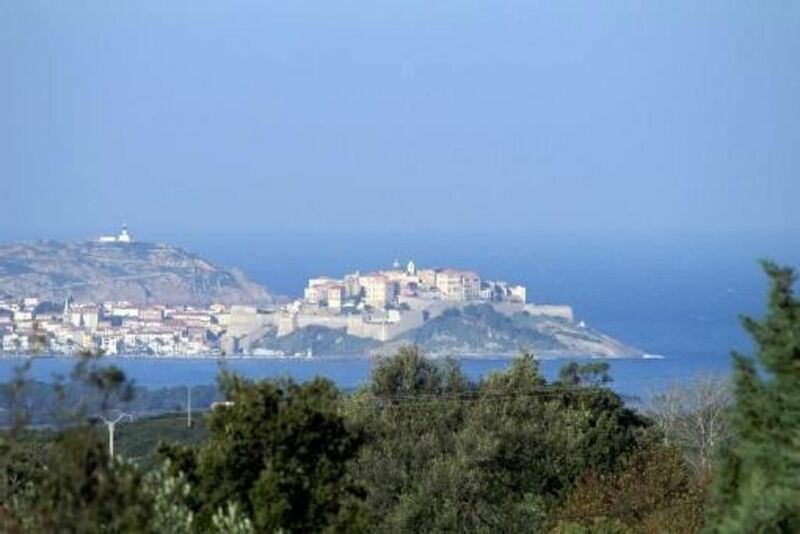 Calvi, with its citadel overlooking the sandy beaches and the breathtaking reefs overlooking a turquoise sea, is 8 km. Calenzana, an authentic village on the edge of the Bonifatu Forest, is less than 2 km away. It is the starting point of many shady paths and the mythical GR20. It is also the seat of the Rencontres Musicales which take place in August. Casa Myrta, protected by its river stone wall, is harmoniously inserted into the surrounding landscape. It is built of bioclimatic natural materials such as local tuffs and whitewash. The surrounding garden hosts the species of maquis and endemic trees in the region. A soothing atmosphere awaits you on the return of your intense day of discovery. CASA AMANDULU has a surface 25 m2, for two people. Small living room with kitchenette equipped with induction hob (4 fire), fridge, microwave, flat screen TV, wifi. Large double bed 160, spacious storage, bathroom with walk-in shower and lime plaster. Washing machine in external laundry. Small terrace with chiliennes, shaded outdoor dining area overlooking the garden, beautiful view. Car / motorcycle parking on the fenced property. Between sea and mountains, on one hectare of land with magnificent views of the Gulf of Calvi and majestic mountains, quiet but minutes from Calvi and beaches, a charming country house is home to three cottages. The house has just been built with ecological materials and Casa Amandulu is a small cottage for two (extra bed for a child available). Its surface of 25 m2 is divided between room and small stay with corner cooks, room of water with shower. Terrace with dining area, overlooking the garden. Private parking inside the property. Surrounded by mountains and villages of Balagne, vineyards and olive groves. The trails of the mythical GR20, the majestic mountains, the rivers with clear waters, the beaches and the reefs are only minutes away ... you have the choice! Small but charming groundfloor apartment (not cottage)with lovely grounds surrounding it. Overall we did enjoy our stay, the apartment is small but quite comfortable. It is finished to a high standard ,the bed was comfortable and the bathroom had a good shower in it. Where we did have some issues was the homeaway app directions were totally inadequate and left us on the main road with nothing to show where the heck this place was. If it wasn;t for the lovely lady in the local petrol station who was extremely helpful I don't think we would have found it. So unfortunately that wasn't a great start, however once we had arived Roberta was friendly and helpful and provided us with some goodies so we didn;t have to go out again. The next two days were great, the garden is lovely and we had a nice time. The last night was slightly less enjoyable because of the layout of the dwellings. The apartment is the middle one of the three, the other two are quite a lot bigger so one of the bedrooms of the other dwelling is above the apartment which caused some noise issues. To be fair, you cannot hear people talk but hard flooring means that furniture being moved around is very clear to hear. Overall the small size of the apartment is reflected in the price but if you can afford to spend more I would think the houses either side would give you a much nicer stay. Thank you for appreciating your staying at Casa Amandulu. We are sorry for the difficulties you got to reach our property CASAMYRTA, usually our guests have no problems with the plan of Google Maps on the platform site and the GPS details given. Moreover on the leasing contract, that our guests get and sign, is shown my mobile phone number and the complete address of the property. The surface of Casa Amandulu (25 mq) is detailed on the advertising, as well as a precise description and many photos of the apartment. Its price is effectively quite interesting considering the high standard of comfort and finishing. The two other apartments on both side (Casa Albitru and Casa Rosumarinu) are each 85 mq, each one has two bedrooms and two bathrooms and a huge living room. They are rent for 4/6 persons and their price is of course far higher. We really hope to have you again as our guests in one of our properties. Très beau cadre, belle maison et grand jardin très bien aménagé. Tout était parfait, merci! Très jolie maison, propreté impeccable, bien équipée, bel environnement et très chaleureux accueil de la propriétaire. Bonne proximité des lieux à visiter et bons conseils de la propriétaire. Nous aurions bien voulu y demeurer plus longtemps. Je recommande cette propriété sans hésiter. We stayed in this appartment in august 2017. The appartment itself is located in a beautifull place, with a nice view of the mountains on one side, and the sea on the other side. Around the appartment was a big garden, where the hostess grew several fruits. The appartment itself was small but cosy, and very clean. We were pleasently surprised by the comfortable bed, that was a big plus. The hostess was very kind and helpfull in showing us several things to do in the area. I would recommend this appartment. Le studio, suffisant pour deux personnes, est très bien situé, un peu à l'écart de Calenzana, avec d'un côté, la montagne et de l'autre la mer. Accueil très sympathique de Roberta qui nous avait mis une bouteille d'eau au frais, et donné quelques légumes du jardin. Elle nous a communiqué quelques bonnes adresses et des conseils de visites. Le studio, à la déco soignée, est très bien équipé, et un parasol est même disponible pour la plage. On y fait la cuisine sans problème. Bref, une bonne adresse. les tarifs concernent deux personnes. Pour une troisième personne un supplément de 10 € par jour est prévu.